It was one of 50 gold award winners out of a total of 4352 entries for the iF Design awards this year: the QF725 Tangent fender made by Taiwanese Qbicle. At Eurobike Qbicle presented two additional models of the Tangent fender, the QF732H for 700C and 26-inch wheels with 28-32mm tire width and the QF228E for 20-inch wheels with 20-28mm tire width. 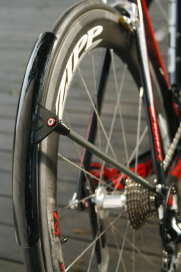 The Tangent fenders are designed for road racers who want top efficiency and anti-splashing. They come with a single-armed stay made of 8mm thick carbon composite. The flap length (for 700C) is 25cm and the fender weighs only 75g in total.